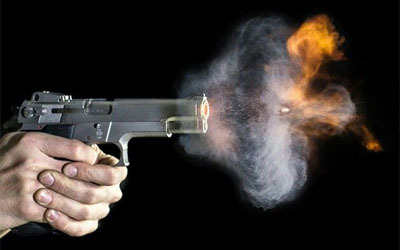 Take a look at this high-speed photo of a revolver at the instant it is fired. 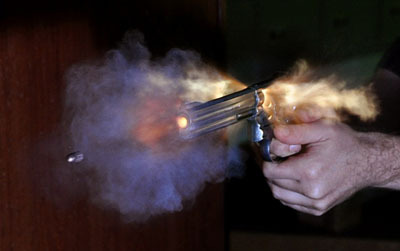 It's clear to see that there is something going on near the rear of the revolver's barrel. It's a phenomenon that's not seen when a pistol is fired. The phenomenon is actually energy escaping from the revolver's cylinder gap which would otherwise be pushing the projectile forward. 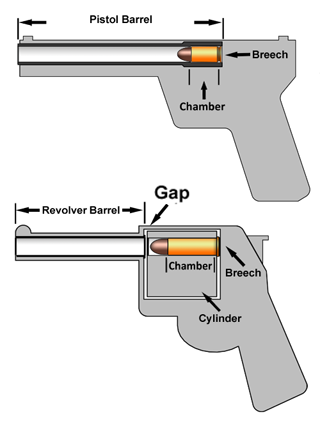 The gap is required to allow the revolver's cylinder to rotate to the next round to be fired. While it's clear to see that some energy is lost through a revolver's cylinder gap, how to determine its real effect on muzzle velocity is not as clear. In reality there are quite a number of factors that are involved; caliber, bullet mass, charge burn rate, barrel length, forcing cone and actual gap width, just to name a few. As for determining the ultimate impact, rule-of-thumb estimates in Internet blogs and articles range anywhere from 75 to 200 ft/sec loss of muzzle velocity due to the cylinder gap. Then the estimates are qualified with, "it depends", naming any one of the factors mentioned here. SAAMI measures the ballistics of revolver cartridges using special "vented" barrels that impose an .008 inch gap just in front of the cartridge to simulate a cylinder gap. This is considered the maximum gap, as revolver designs can have a cylinder gap anywhere between .002 and .008 inches. Most revolvers will have the gap closer to .008 inches. If the gap is too narrow the gun's operation can be affected. Metal expansion due to heating, or gunpowder debris, or both can cause a narrow cylinder gap to close up or clog, impairing the cylinder's ability to rotate. When it comes to approximating muzzle velocity for a revolver based on a cartridge's ballistics test data, we ignore the effect of the cylinder gap if the reference cartridge's ballistics were measured with a "vented" test barrel. This is because the effect of the gap is already incorporated in the original test data. The revolvers in our handgun database are chambered for as many as 36 different calibers. But, of those calibers only 14 were tested by SAAMI as revolver cartridges using "vented" ballistics test barrels. The remaining 22 were tested as either rifle or pistol cartridges using "non-vented" test barrels. Conversely, a number of pistols in our handgun database are chambered to fire revolver cartridges, 7 calibers to be exact. So, for the 55 calibers which handguns in our database use, 29 of them are "crossover" calibers. They are either tested with "non-vented" barrels but are also used in some revolvers, or tested with "vented" barrels but are also used in some pistols. In those "crossover" cases, how do we compensate for the gap in our muzzle velocity approximations? 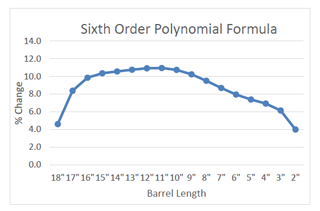 The online article, "Fascinating Phenomenon in Cylinder Gap Data" written by Steve Johnson on TheFirearmBlog.com in 2011 is a thoughtful musing of the subject worth reading. Again, the only source of empirical data that can be found on the subject was generated from tests done by our friends at Ballistics By The Inch. Steve Johnson used this data for his analysis, and following suit, we did as well. We give yet another shout-out to BBTI for their great work. 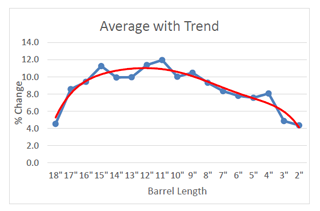 Using BBTI's test data we developed an algorithm that generates a percentage change in muzzle velocity due to cylinder gap based on the handgun's barrel length. This algorithm will be part of our new approximations for ballistics represented in our handgun database. A PDF report on how our developer crunched BBTI's test data and developed our cylinder gap approximation algorithm can be found HERE.